A lawsuit may be brewing between Disney and Brightspark Production Ltd. over an animated fairytale called Braver, The Guardian reports. 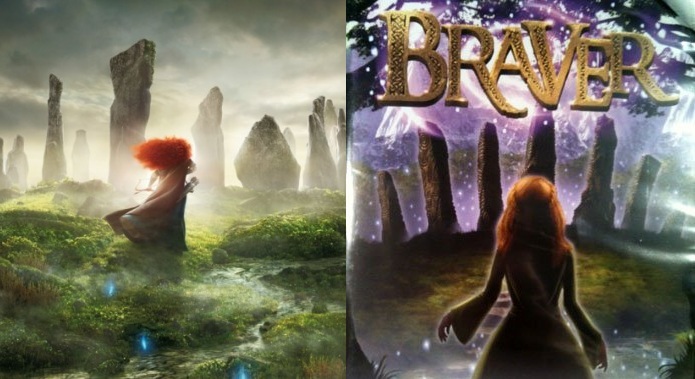 Not only has the UK company tacked an ‘r’ onto the end of Disney Pixar’s latest hit film Brave, but the cover and character art looks incredibly close to Disney’s concept (albeit an el-cheapo version). Braver is the latest in Brightspark’s list of direct-to-DVD titles including Tangled Up, The Frog Princess and Little Cars, which don’t require too great a stretch of the imagination to deduce their inspirations. While Disney believes Brightspark to be misleading consumers based on their well-established brand, it has not filed a lawsuit yet but simply administered a warning to the company to cease sale of their products. Discuss: Does Disney have a case?